So often those getting alterations for their formal gowns anticipate a simple tuck, a small adjustment and that all time favorite “simple” hem. What I have discovered over time, is that what aids the client in not comprehending the cost of alterations is that of some of the bridal shops are sharing “Oh, all they have to do is take it in a little”. While this might be true, it does not clearly prepare the client for the reality of their alteration need. Many times that consultant at the bridal shop has no clue as to what is entailed in altering a simple shirt never mind a formal gown. Lace, bonding, french seams, beads, trim, chiffon fabric, silk fabric, etc. All of these elements play a part in your alteration costs. For those that are looking online for a “guide” to their alteration costs, be leary of what you find, as many are providing poor information. Some data is old, while others are all relative to the seamstress skills and ability to determine the appropriate adjustments, along with other brides sharing their personal thoughts. Yes, new seamstresses will be charging less, but keep in mind that not all seamstresses have the ability to do the work you might need. If you are on a strict budget, call a few different seamstresses and ask questions. If you are unsure of what you need, consider paying a consult fee to determine the needs. If you are someone who might be able to do the work yourself with the desire to save money, the guidance will be very valuable. This guidance has been used by some brides to determine which seamstress they would like to work with as well. If you are not going to do this on your own, the consult will provide you an idea of the cost. A good seamstress will take the time with you, approximately 30-60 min. for approximately $50-$100. Do NOT plan on them pinning your dress so that you can go home and do the work. Yes, this happened once to me, and the bride was upset when I took all the clips & pins out before she left. If you do want your consultant to pin and set things in place, in order for you to do the work yourself, plan on at least $150 or more for their time. And, bring your pins, clips, etc. If you are confident in what needs to be done, such as take in at the sides or zipper, hem, sleeve adjustment, bustle, etc., provide this to the seamstress when you call. Some, such as myself, prefer that you follow-up with an email with pictures along with what you are looking to have done. Provide details such as how many layers, whether there is boning where it needs to be taken in, whether you are looking to have transformed (grandmother’s gown made into something to be worn today), fabric content, etc. These details are important in providing you an estimate. Also, what I have found to be quite helpful is when brides/bridesmaids, etc. provide me the style number and a link to their dress, showing various views, that I can then come closer to an estimate along with pictures of them wearing their dress. Don’t expect that your alterations will be $50-$100, even if you have one layer that needs to be hemmed. What goes into the cost of hemming a gown is that of the time your seamstress spends with you, his/her experience, the amount of time to cut, pin and hem, and various overhead costs. Although most of us have a basic idea, and can provide an estimate, the actual costs can vary due to the style dress and your particular needs. Plus, there is time factored in for time spent in consulting with you. Remember, part of their job is to give you a finished look that you will be happy with. Unless you plan on going barefoot or have a non-floor-length dress, be sure to bring your shoes. Your shoes are part of the completed look, and the height you choose will determine how much will be needed to remove. I have encountered many brides who have worked hard at losing weight and want to look amazing in their dress. They desire it to be form fitting. Keep in mind that your seamstress is aware of the potential problem when you request that your dress be altered so tight that you can’t sit down. Once you are fitted, even if you seamstress does not ask, sit down in your dress. If you struggle to sit down or need help getting up, this is a sign that you are not going to enjoy your day in comfort with a risk that your dress might encounter some seam malfunction. Try to schedule your appointments around the time you will be married (i.e. 2 o’clock wedding, see if you can get an early afternoon appointment), although this is not always conducive to all work schedules. The reason is that our bodies change due to various aspects to our day. Unless you do not eat, you will gain a couple pounds, and some ladies do bloat due to the weather as well. Do not haggle with your seamstress over the cost. Just because you got an amazing deal on your dress does not result in a discount for services. If you select a seamstress based on skill, examples of their work, and recommendations, you will be paying for that. A seamstress is a consultant as well as a craftsperson. They have developed their rates to cover various aspects of running their business in conjunction with their skills. This results in the cost of doing business. Be mindful that a seamstress does not have to take a job on. He/she might want to work with you, yet if you disrespect their time or talents, you might end up having to shop around for a new seamstress. For myself, I try very hard to keep things cost effective, but I can’t provide you 10 hours of labor for $50 total. Yet, if my initial estimate is more than what I see needs to be done when you arrive, you will obtain that savings. Please note: This does not happen often. If you make changes along the way, expect your costs to go up. Know up front that your bridal gown alterations can range from $250 on up to over $600. 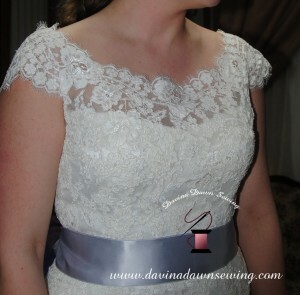 The more work your dress needs, the more delicate the fabric, etc., the more it will cost. Be mindful that you yourself would not want your own employer to haggle with you in having you do more work for less money. Be prepared to pay a deposit of at least 50%, sometimes the full amount. Plan on cash payment or personal check. Every seamstress is different. Some might accept credit cards yet this is not common, as credit processing has expenses not seen to the consumer. Expect rush fees if you need your dress back in less than 6-8 weeks. The sooner you need it, the more the cost of the rush fee. Show up on time to your appointment. Just like your physician or mechanic, your seamstress schedules their day to meet with you as well as work on projects at hand. Provide 24 hrs. to cancel or reschedule if you find you will not be able to arrive at the appointed time. If you do not show up on time or do not call to reschedule, plan on a no-show/late fee. This is a result of precious time being wasted for the time your seamstress set aside for you. In addition, not showing and not calling, might result in a seamstress not working with you, now or in the future. Your decision to have a seamstress work with you is a relationship that you develop during the course of your wedding preparations. They want to see you feel beautiful walking down the aisle, so their efforts to alter in creating your desired look, are a result of a team effort between you both with transparent communication. One last note: We all love to see brides have the support of their mom’s and bridal party members. But, many times it is not the “Bridezilla” we are concerned with, but rather those who take control and start deciding for the bride what needs to be done and the cost that it should be done at. At least for me, I’m working for the bride, not the mom, not the maid-of-honor, etc., unless of course I am working with them on their dress. In reference to other formal wear. Prom dresses (and bridesmaids) can range between $150 on up over $600. Yes, believe it or not, that gorgeous princess gown, with multiple layers, with various nips and tucks can be a little pricy. Generally they average around $150-$200, but I have also done a few for much less because there was only one thing needing to be done, yet I have done a few for over $600. Again, bring your shoes. Mom’s of the bride or groom. These alterations vary depending on the style dress. It is hard to estimate without seeing the gown or discussing details.